MOA reader, Don Fields, sent in this wonderful Northridge Fashion Center postcard, along with his own youthful memories of the place. I thought I'd share not only the great photo, but also (with his permission) his fun reminiscing too. Many months ago, while looking for any web sites on old 60s & 70s malls, I bumped into yours and, needless to say, was bowled over by your collection, knowledge and enthusiasm for this topic. So many old and uniquely designed palaces you have managed to mined that haunted my childhood and dreams. Being a former mall rat myself (mid 70's to the very early 80's) and to show appreciation for what you've been doing for us rats, I'm sending you the following postcard for consideration for your web site. It's an old 'card of the older Northridge Fashion Center in Northridge, CA. During 1977/78, I lived in Northridge and my favorite weekend place to hang out and away from the San Fernando Valley heat was this mall that first opened in 1973 [most online sources point to '71 --Keith]. I still love the place because the architecture and interior was heavily 70's influenced and was lit not too brightly which was good as that Valley sun would beat down on ya like a baseball bat. The center had your usual flagship dept. stores, but with their own designed courtyards in front; Sears was standard but JCPenny had a small forest, Bullocks had a circular and more "mod" setting & Broadway had the largest and highest one. Bullocks was quite unique all by itself, one of the design features was a central mirrored escalator area with lighted streaks. It may not seem much, but to a bored Valley kid, stepping on that Bullock escalator was like stepping into a Star Wars set. I heard from someone on the LottaLiving message board that when the place first opened, they had bean-bags instead of the usual rest chairs. Guess THAT didn't last too long. Anyways, the mall didn't have a "food court" as many of the food stands were scattered, but they did had a couple of restaurants surrounding the 3 screen movie theatre where I saw flicks like 'Fire Sale', 'Saturn 3' (first of many late 70's weird sci-fi flicks, thanks Lucas?! ), 'The Goodbye Girl' and the last two Bad News Bears. Even though I moved out of the Valley, I used to take the occasional trip back and visit this old friend of mine. As you know it was seriously damaged during the 1989 earthquake and has gone through total remodeling and looks nowhere near the old self anymore. I have been to interesting malls like Del Amo Fashion Center, MetroCenter (in Phoenix, AZ), Fox Hills Mall, Ports O' Call and a couple more Valley ones before I grew out of malls in general and all, but this place will forever be permanently stuck into my consciousness like a bad habit. I don't know if there are any other old pics of the older place, but imagine my delight when I bumped into this postcard while on business in 1988. Noting your extensive collection, you may or may not have this one, but I'm tossing this to ya anyways. Thanks for the site and I look forward to seeing more parts of retail that I can tolerate. Don Fields (aka "Don-O" on you comment area)"
Early Anchors: JCPenney, Broadway, Bullocks. Later it added Robinsons and May Company. This mall was devastated during the 1994 Northridge Quake. The mall was closed for over a year before reopening. The original Bullocks and Broadway both sustained major damage (the Bullocks store collapsed). When this mall reopened in 1995, the anchors were Robinsons-May North and Robinsons-May South, Sears, JCPenney, Bullocks and The Broadway. The Broadway was made into a flagship modern store, that only lasted a year before it closed in the Macys merger (Macys kept the Bullocks location). Robinsons-May then closed their North Store, and consolidated to their south store. This wing of the mall was gutted and made open air, along with the Broadway, which had a large hole in the middle for a walkway. The Broadway was split into Cost Plus, Borders, Restaurants and a gym (plus nothing in the basement - its still for lease (see leasing plan). The May Company Store was torn down for a 10 screen movie theatre. Today, the Robinsons-May is empty, and the mall only has three Anchors. Even though the mall is not even close to being dead, this poor mall has had a lot of growing pains. I love the site of the Petrie's!!! And I thought Don's essay was great!!! Hmm, I noticed I got the earthquake date wrong. Ah, I've been living in LA for so long that I'm beginning to loose track of those 'quakes. Anyways, I think I got a Musicland business card from this Fashion Center somewhere, I might scan it and send that in, too. As I said before, its too damn bad that there ain't anymore OLD NFC photos out there. I feel spoiled as I judge other old malls from this one. Still, Keith does whip the bunny outta that hat with true gems to make me put the boot in my mouth. I'm still dizzy over that Simpson mall picture. Thanks for the inclusion and kind words! That interior decorating is awesome; feel like I'm at the discotheque or something. Good times, too bad it had to be rebuilt. Anna Millers Pies, Fiddler's Three, the original Don Ricardo's with their 99cent Huevos Ranchero's, Kaplan's Deli, Bob's Big Boy Jr. The quick stops: Orange Julius, Pretzle n Cheese. The 70's stores like Judy's, Petries, Foxmore Casuals, Wild Pair, Leeds Shoes, Spencer. The anchors: Sears (they had 45 cent hot fudge sundaes in their cafeteria), Bullocks (does anyone remember the size of their cosmetics department? It had seperate areas for different lines and it wound around and around),The Broadway, the best store of all- nice merch with little snob appeal. Everyone could shop there. I worked there while in college and it was a great experience. So many nice people. To this day, I live down the street for Nr. Mall. Eventhough I rarely go there now, it is etched in my mind as the one and ONLY true mall! haha! I remember the Broadway's upstairs restaurant, and Don Hodel's family buffet. So many wonderful memories there all over this place. Thank you for the great memories of stores and restaurants, recorded here! I have forgotten so many things, take care! What a great find. The Northridge Fashion Center played an indellible role in my adolesence. I hung out there almost every day from 1972 - 1977. I lived just across Tampa from the mall until my 20s. I could see the original Bullocks store from my bedroom window. The design of that store was fascinating with pyramid-inspired angled exterior walls covered in a terra cotta tile. It was so cutting edge and quintisentially Californian. Bullocks was the very first store to open in October 1971. I went with my mom to the grand opening party. The mall and the other anchors followed a few months later. I watched the mall rise from what was previously an orange grove . It is very interesting to me that the Bullocks store was under construction in February 1971 when the Sylmar earthquake struck, and essentially collapsed in a pile of framing lumber. 23 years later in January 1994, the store again collapsed in the same way. I guess that after the '71 event, building codes were not improved. I bet I hung out with "anonymous" because his/her recollection was spot on. I used to sneak cigarettes from my mom's purse and smoke at the mall and in the movie, which I would sneak into too. Remember when you could do that? My favorite store was "Innerspace" a waterbed store! It had numerous waterbeds displayed and set up in all kinds of very groovy "rooms," complete with shag carpeting and velour bedspreads. Very Shagadellic! I also loved Spencer for their blacklight poster room and the naughty gag gifts they sold. 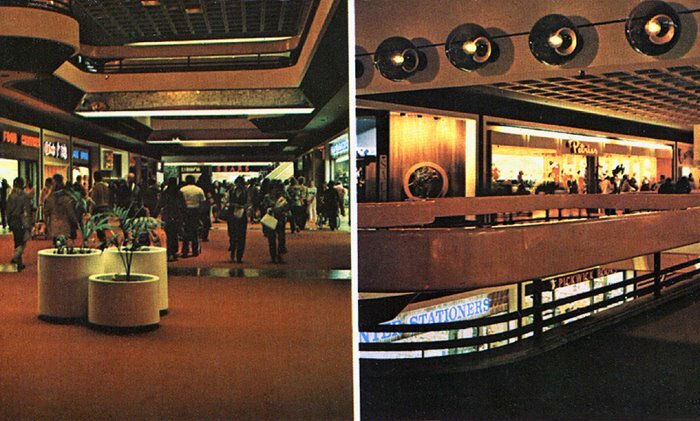 The decor of the mall was also so cool in the early '70s. The use of plastic materials for the railings and public seating seemed so futuristic. It was a great place to hang out when you were a valley teenager. OMG! Your site is totally RAD! I practically lived at this mall as a youth, worked there as a teen at JCP ('81-'84), and now live walking distance from it with my family. I miss the "old" Northridge Mall, tho. The awesome restaurants that others have mentioned -- esp. Fiddler's Three! 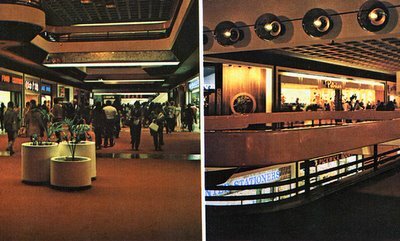 anyone have any pictures of the northridge mall from the 80s? do you remember the stair cases in the center of the mall, where the fountain now is? there was a record store on the ground floor. and i totally remember those futuristic chairs. i think there were four seats per seating area. wish i had pictures from back in the day! I remember the opening of Bullocks, I was nine or ten. Sears had a small building next to it that was used for catalog sales... remember the mighty Sears catalog? Later it became the Toy department. At Christmas they had thr slot cars setup there... dream, dream, too cool. The smells of " The Nut House" and their great white chocolate. The pet store was next to Spencer's gifts. Pier One Imports had rod iron and bamboo furniture. Musicland had Elton John's "Goodbye Yellow Brick Road. "That was up on the second floor next to the entrance for Sears. They always seemed to have some guy demonstrating an organ next to it. As I got older we had to go there to check out the chicks. They all had Farrah Fawcett type hair so foxy! AH Junior High in the Val, so so. cal. Really. I found this site by googling "old pics of The Northridge Mall" and loved reading everyone's comments! I lived in Northridge from September 1971 thru June 1973 while I was attending SFVSC/CSUN and I remember visiting this mall often. I don't have a specific recollection of it's opening I just remember it being "fresh" back then. I love the write-ups on the mall on this blog. I too remember plastic seating, the mirrored escalators, and the Spencer's gift store. I remember buying an Indian bed cover/sheet from a store that was like a small Pier 1. I remember a story I heard on campus that the May Company store manager hired a lot of college students just so he could go to a periodic breakfast or other event with the college president. First, a very entertaining website! I worked in this mall for 8 years during the 80s, at one of the bookstores within. The bookstores, like most of the mall from the the '70s and '80s, are long gone, but I have a lot of good memories from there. Very amused to see Fiddlers Three mentioned here. I ate my lunches and dinners there a lot, during my breaks at work. Anna Miller's, too. And I'd go out with co-workers to Don Ricardo's for drinks after work, sometimes. Also loved the small movie theater complex in the mall. Very convenient after a day's work at the store! Wish there were more pictures, but I'll take what I can get. I'm thinking most people posting here either knew each other from growing up in the valley or at a minimum we walked past each other as we roamed the mall every weekend. When I visit family and we go to Northridge Mall now, I sometimes feel like I see ghosts of the past. It's fun to see these pictures. Wasn't there a pizza joint inside the Northridge Mall in the 70's - mid 80's? I remember it being upstairs. Originally it had that 1970s ambience with dark wood (paneling?) and booths. Later, I seem to remember they made it look "New Wave 80s" with neon signs, etc. I thought the name was Padrino's. The thing I remember most is their awesome deep-dish pizza made in large square pans that they would bake "covered" inside the oven. Sound familiar to anyone? 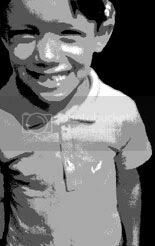 I moved to the Porter Ranch area in the summer of 1975. The neighborhood "gang" that I hung out with used to go to Bob's Jr. almost every night. I think one of the guy's next door neighbor/girlfriend worked there. Anyway, in the mid-70's neither the movie theater, nor anything else was "run down". It was a great place to go with friends or family. It was designed in a totally 70's look. I still think the coolest place was Spencer's poster room. Oh, my! Does this bring back memories. I worked at Sears Northridge 1977-1987. Padrino's was the first place I ever saw pizza-by-the-slice, perfect for lunch when if I didn't have a full-hour to walk to the Broadway's restaurant. If it was the dinner hour, it was Fiddler's Three. Otherwise my breaks were scouring through the books and magazines at B. Dalton Books, or breathing deeply at the Tobbaconist. My first few jobs were at the Northridge Fashion Center. I worked at the men's clothing store Topps & Trousers which was downstairs near Bullock's I think. I also worked at Windsor Fashions that was upstairs and at Michael's Toys and Hobbies. I remember taking one of my breaks and heard that John Lennon had been shot. Such a surreal experience. Met many boyfriends at that mall and would occasionally sneak out into the remaining orange groves next to the mall to smoke a joint. Ladies, remember Contempo and Pidgeons? My best friend was the manager of Lim's. Hi, Cool Memories! I worked at The Plant Peddler & Florist around 1980-82. Remember how popular plants were back then? The whole floor in the plant peddler was red bricks. I was in high school (Kennedy High)when I worked there.The Plant Peddler was located at the bottom of the "futuristic" Tunnel escalator in the Mall close to the movie Theater & don recardos! My job was to water all the plants in the mall! I would fill up a 55 gallon drum with water and plant food and tug it around on a cart throughout the mall trimming and watering the plants! When I was on break I would often go to the Baskin Robins and get Ice Cream! I also liked Bob's Jr.
Wow it's been 30 years since that time! Amazing! I lived here between 1976 and 1981. The mall was where I always wanted to be (aside from the Malibu Grand Prix and the Waterslide next door. (Golfland)? Anyway, I worked in the GCC cinema across from Bullocks in 1981 for the summer. Mr. Carr was the manager. When Stripes opened, he asked everyone to go to the nearest Army surplus and buy uniforms to wear on opening night. That was a lot of fun. I loved working in that place. I especially loved cleaning the theaters after every showing (mostly from the dropped money I always found on the floor). I remember Padrino's pizza. Awesome deep dish pizza. I remember the escalator from the Bullocks court going up toward Broadway with the lighted circular ceiling. I remember Rocketdyne next door to the mall. I could always get oranges that grew around the building (never went hungry living in the Valley, fruit and nut trees everywhere!). I remember the Winnetka 6 drive-in. My friend and I used to drive in with our bicycles (the ticket booths never had a problem with this). We'd bring our lawn chairs and be sitting there watching Superman. I remember that mall so well. Applied for a job there as it opened up. Does anyone remember the name of a very cool kind of hippie store that sold all sorts of jewelry, purses, clothes. It was upstairs and was the place to buy cool stuff. Worked at tha mall when it first opened.Wokked outside 11pm to 7am outside running sweaper.Does anyone remember larry stevens.how about tom collins. Wow, what memories this brings back! I remember going to the Northridge Fashion Center right after it opened, and for many years after. I worked at Pier 1 Imports from '73- '75 (next door to Michael's Toys). The entrance of Pier 1 featured two bridge looking walkways with posts and thick rope "handrails" (very pier-like?). My high school friend Denise worked at See's Candy diagonal from Pier 1. During breaks I'd go over for "samples". GREAT memories...Used to eat lots of Big Boy hamburgers...After leaving the valley 25 years ago I returned to have a look last year and found very little to be familiar at the mall. New look, and new people gathering their own "memories" of the "place" that is the Northridge Fashion Center. I just came across this post, while Googling malls of the 80s. "And NO! You cannot come in here to just order sodas and eat the chips." I also always browsed at Merle Norman Cosmetics. Bullocks was my go-to after I was 16 and got a job. My first job was at the theatre. Then, to my amazement and excitement, I got hired at Merle Norman! I quit the theatre and was snubbed by the manager. So???? I was a new beauty consultant at the coveted Merle Norman!!! Yeah!! Alas, that was prematurely cut off when the manager. Maureen, found out I was not 18 yet. I know that I've gone on and on. Please just find it in all of you to know how nostalgic I have felt to come across this site! I started at Nobel Junior High in the fall of 1973, so that mall was a definite hang-out. Malls in general were so different then. No "food court," as the eating places were scattered throughout the place (same with Topanga Plaza). Loved the Big Boy Jr., and Pretzel 'n Cheese. I think my family ate at Don Ricardo's once or twice before seeing a movie there. Sears was the "low-rent" department store of the four, but I loved that candy counter, always making fresh popcorn which would entice us to beg Dad to buy a box as we made our way down to the tool and hardware department. And here's one item that I haven't seen mentioned yet: three of the four department stores had outlying tire and repair shops in the parking lot. Yes, you could drop your car off for a set of new tires at the Broadway Tire Center, and shop while they were installing them. My parents even bought an 8-track car stereo at the J.C. Penney Tire and Auto Center. And of course, you could get DieHard batteries and Road Handler tires at the Sears Auto Center. Definitely a time gone by. Wish there were more photos various parts of the interior. Doe anyone remember the music store that sold sheet music and instruments. I was friends with the owners son Warren. Yes to all of this madness. It was 1976-82. Me a grade school/junior high kid allowed to rome the mall solo. The pretzel shop would give you a little extra cheddar if you asked, and you could buy a fortune scroll to be freaked-out by while you ate. Random memories at this mall... First time I felt both ill and compelled by an album cover (thanks AC/DC). -unrelated- First time I saw genital based humor - Thanks Spencer's. Hiding in clothes racks... Wondering why such a fancy place would have a K-mart style cafeteria (J.C. Penny had a cafeteria!) Blacklight posters, and my first two player game of Space Wars! Yes, there were chips and salsa and cherry cokes at Don Ricardo's. I seem to remember watching a movie about bats, but more importantly, that end of the mall with the theaters was home to an all white, circular courtyard. open air to the floors above. The tile floor was slightly convex, and in the center like a spire, or more like a totem pole, was a two-story glass prism. It was supposed to do something, there were fixed lights all around the second floor balcony aimed at it. I never saw them on, and I heard a rumor that it didn't work - whatever "it" was. I was certain it was a rainbow dome hologram. & @POWERPOP78 - Yes I bought some sheet music at that store. lots of wood stuff in that store. I worked as a cook at the Sylmar Fiddler's Three, but sometimes would help out at the Mall Fiddler's when they were really busy like at Christmas. It was a great place to work. I have forgotten all the drudgery work and only remember the fun stuff. My grandfather built Don Ricardo's. It was so sad to see it go. Loved those brick archways. I was always so proud tongontonthe mall and know my grandfather did this. Oops typos. I was so proud to go to the mall and know my grandfather did this.